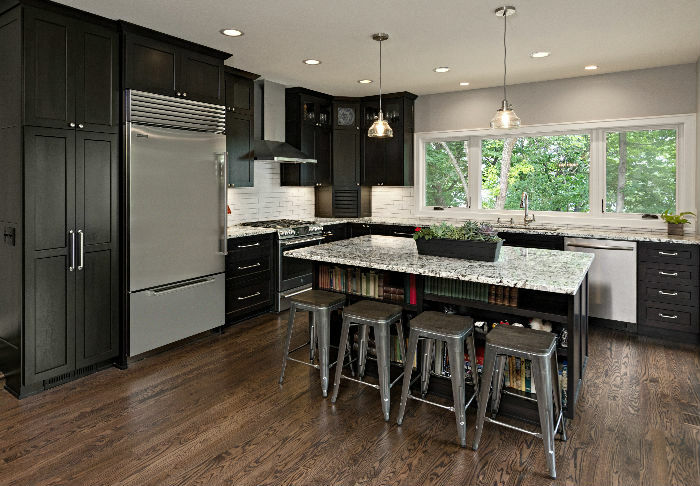 We specialize in high end remodels and designs in the west metro areas. 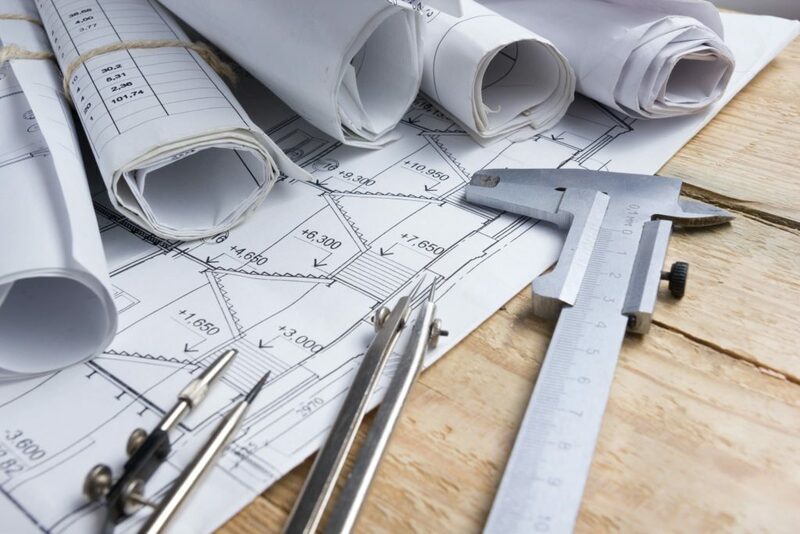 With over 20 years experience, we can provide a custom solution for any room you have. We’d love to hear about your space and your thoughts to improve it. Be inspired by this main-level remodel by SDI! While remaining within the original footprint, this kitchen was opened to the rest of the main level and reorganized. We removed a 3′ x 3′ landing at the stairs going to the lower level, added a large window to enjoy the backyard view, added a desk and created a large island. Main level has stained maple flooring and new painted trim throughout. 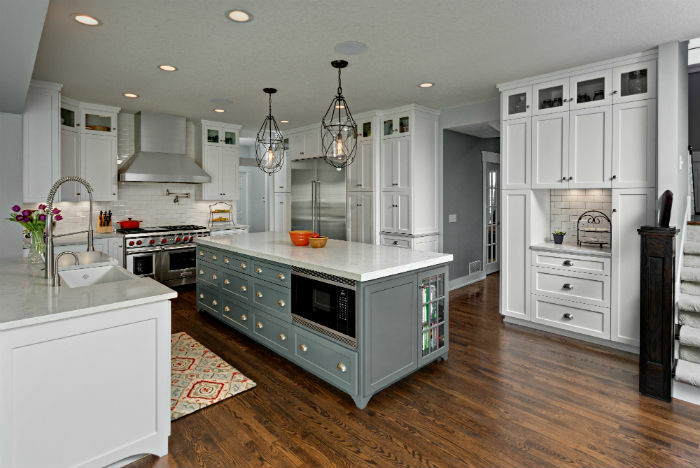 Custom-painted grey and white cabinetry. Countertops are a combo of Cambria Ella, maple butcher block and terrazzo and marble quartz with grey subway backsplash tile. The kitchen of this home was opened up to the sun room and family room to create one large, main level connected space. The kitchen features include: two island, Wolf and Subzero appliances, Difiniti Evoke Viareggio quartz countertop with one island having a two-inch built-up edge, pot filler, white and grey painted custom cabinetry, white subway tile backsplace, stained oak flooring, breakfast center area and entertaining area. This home now functions very well for entertaining and family time. Now this is contemporary! Come see how we transformed this lower level into a contemporary oasis to entertain, exercise and relax. This lower level features an entertaining kitchen with a butlers pantry; recreation/tv area, exercise room and bathroom with sauna. 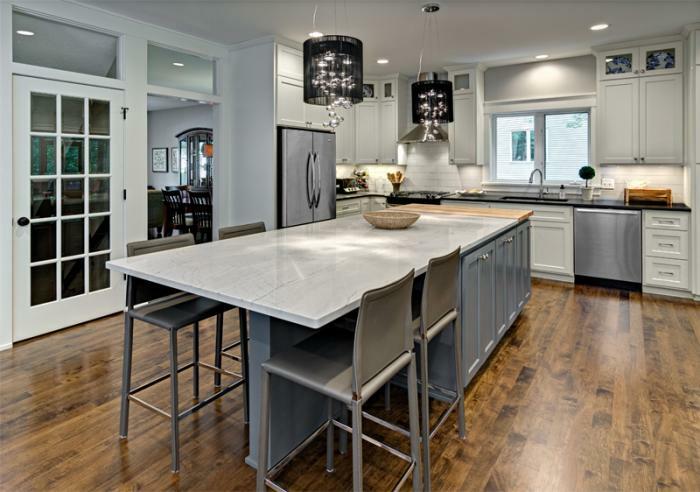 Concrete grey epoxy floors throughout, grey painted cabinetry with Caesarstone Piatra Grey countertops. Three televisions on a paneled end wall with concealed doors providing access to hidden storage and another television at the bar. We provide full service interior design to help you through your numerous selections and design details necessary to create your visions. © 2019 Structural Dimensions, Inc.